I had took the week off to do a few trips and to mainly meet up with the coast to coast lads. I had a trip to the forest with Dave to try out my new toy, a battery powered spit, mainly for when i go car camping with the family and now and again at home, so with a last minute plan, me and Dave sorted a trip out to the woods. A good start to my week off, we went to the butchers I always go to for a good cut of meat. Writing this and thinking back to the trip has got my mouth, flowing with juices. At the butchers we went halves on a good £20 bit of silverside beef. We were running late as per usual and I had sat on my arse all day online. A waste really as I needed to get a little stool and a foldable shovel. So, all packed up, I jumped in Dave's car and off we went to the woods. It wasn't a long drive a little over half an hour. We donned our packs and carried the beer and meat in carrier bags, god knows what people must have thought if they had seen us. The walk was about a mile probably the longest we have walked into woods to camp. It was boggy all the way along the path and full of fallen trees. A nice stream was running along our path. we hadn't made plans of where camp, but it wasn't long before a little gem was found. I think I can speak for both of us to say one day we will return to this place. Dave started to put his tarp/basha up and I scouted about looking for dry wood which was not easy. There had been a lot of rain and everything was soaked. After a bit of searching I had the wood and in true style sparked it up first go with my cotton wool smeared in petroleum jelly. You may say well that's cheating but I'm not out to be Ray Mears just a cheap way to be out doors and eat well. 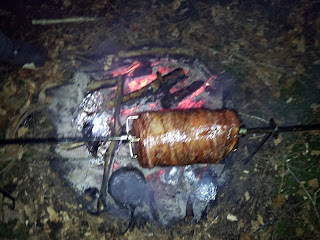 Once the fire had hold next was preparing the beef. Rubbing olive oil all over and coating it with black peppercorns and salt it was ready. Onto the spit it went and over the fire. All we had to do is keep the fire going, sit back and drink some beer. That's exactly what we did. Not realising how long it was going to take to get fire up to cooking standards and meat on. I had thought 3 hours but by the time we got the fire up and running it was after eight. The meat was ready at midnight, a little over to be picky. The worst part of doing meat this way was sitting watching it. The colours were memorising. I don't think me or Dave have ever gone through such agony. Saying all that, by the time we sat down with our plates full of meat and gravy, with Dave having a few tattys and veg, we sat there making more noise than a motorbike passing you in the street. Mmmmm nom nom nom for at least half an hour. Thing is I ate so much juicy beef I had to leave a couple of slices I felt sick. It wasn't long before we both retired into our bivis stuffed like pigs. 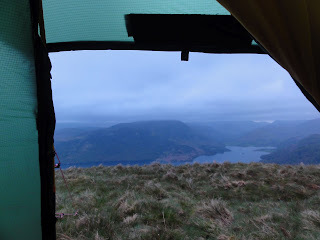 I slept well and the rain kept off. 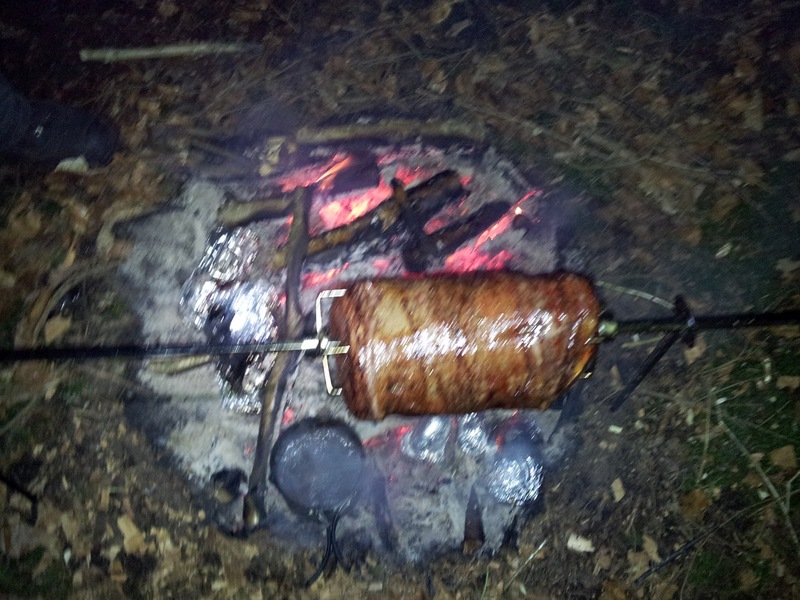 I cooked us up some bacon, the fire was out but there was some embers with a bit dry tinder and a breath from me it was all systems go and it wasn't long before we had the bacon eaten and began to pack away. 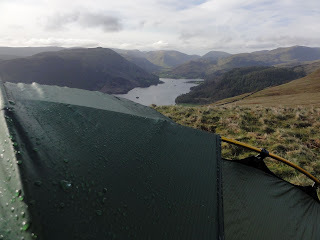 Another good trip had and more fond memories of camping wild. My next trip should have been to meet the coast to coast lads. As always i left things to last minute and more to the point had a right old job to pack my bag. 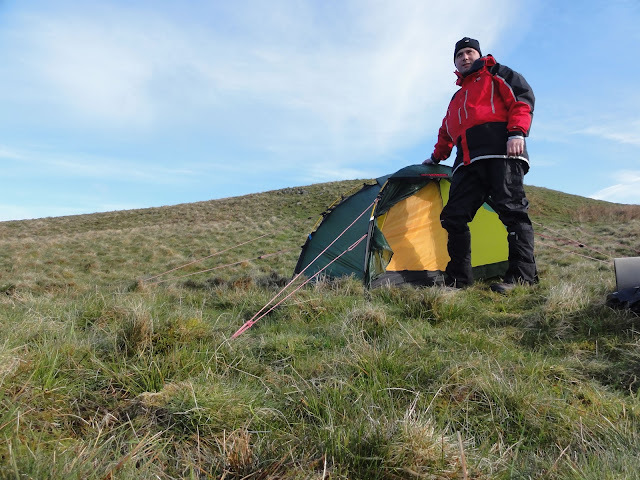 It was a case of do or will I need a warm sleeping bag, my down jacket or not. It took me two hours packing changing my mind re packing I was pissed off to say the least but eventually just two hours, later than I had planned to set off, I was in my car heading for some mine in the Dales. On the A1 and half an hour into my drive all happy again, my pissed off mood had gone, lol. That was until something popped into my head.......I had forgot my boots!!!!!! The weather was grim, raining heavily, with gales forecast. Oh dear, this was to be the end of my trip. I took the next junction off and went back home. I tried texting the lads and phoning but both phones were off or out of signal. I thought to myself how will they know that I have cancelled, this, added to my down feeling of the day it couldn't get any worse. Late on the night the lads phoned me whilst I was walking my dog. Asking if I was there? I explained what had happened but they had worse news. They had been in very bad weather having the back packs covered with a rain cover and gear in dry sacks, all their gear was soaked. They went on to tell me that it looked like they were going to cancel their trip and finish it off on a later date. Devastating news, in fact they did go on to cancel which was a shame. I was hoping to meet up with them the next day but they couldn't see how they could carry on with gear soaked and with work commitments they didn't have enough time to take a few days off to dry and wait for a better weather window. So wondering what I was going to do, sitting in the house with a brand new tent, I searched the maps for a close by potential wild camp. 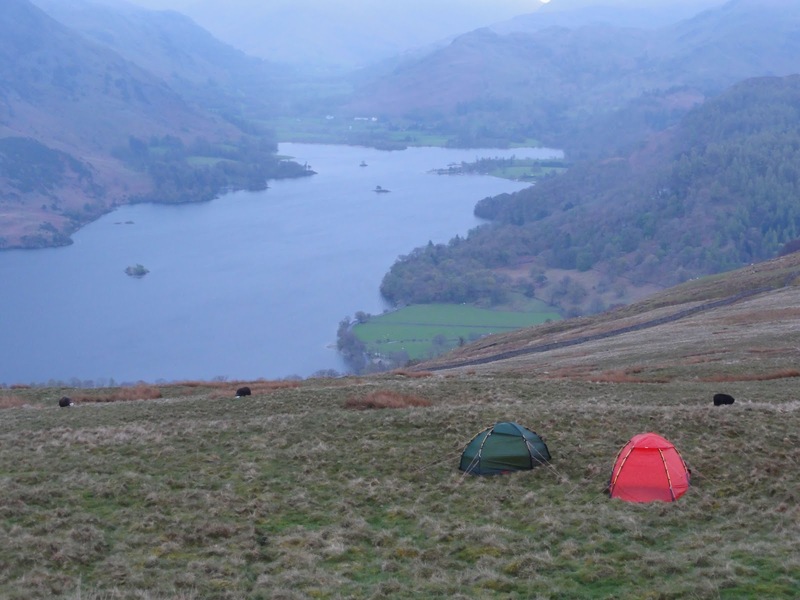 I was in luck, A friend of mine, Chris Cox, was heading up the lakes for a quick one nighter. This turned out to be be my window of opportunity, so I sorted it last minute with him and arranged where to meet. Off out. Car loaded, away I went, this time with my boots. Chris was only stopping till two am and then heading back down. He lives in Brighton which takes him five an half hours to get home. So I met Chris where he had planned to park got suited up as it was forecast rain and off we went. Although I am unfit and still not doing anything about it , I managed to get to the top pretty easily with a few stops for pictures (honest). We arrived at the top of Common Fell. Wind was picking up and I managed to get 30mph max gust. The wind chill was -4c, which was bloody cold. We had a little chat on where to pitch as Chris needed his sleep for that mammoth drive back home. A more sheltered spot just off the summit was agreed and without any more chattering we were off to pitch tents and get some food on. Food on, 'Look What We Found' with a couple of baps and I was full. Time for a few brandys and chat, sitting in Chris' tent till about nine and I left him to get some sleep. I chilled in my new Hilleberg Soulo, door open, just watching the lights down below. Very peaceful I was in my element. Two in the morning came with me opening my eyes to what felt like a lighthouse shining its light, it was Chris packing up. I turned over and off to sleep I went. 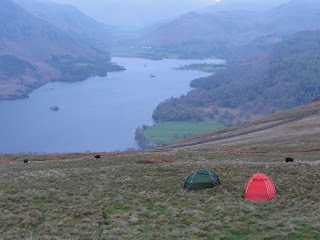 I awoke to birds singing and the sun shining through my tent. Wild camping and another dose of good weather. It was just before seven and I opened up the door to reveal a sunny bright morning , it was lovely. I had made no plans to jump up and pack up but just to enjoy the morning. 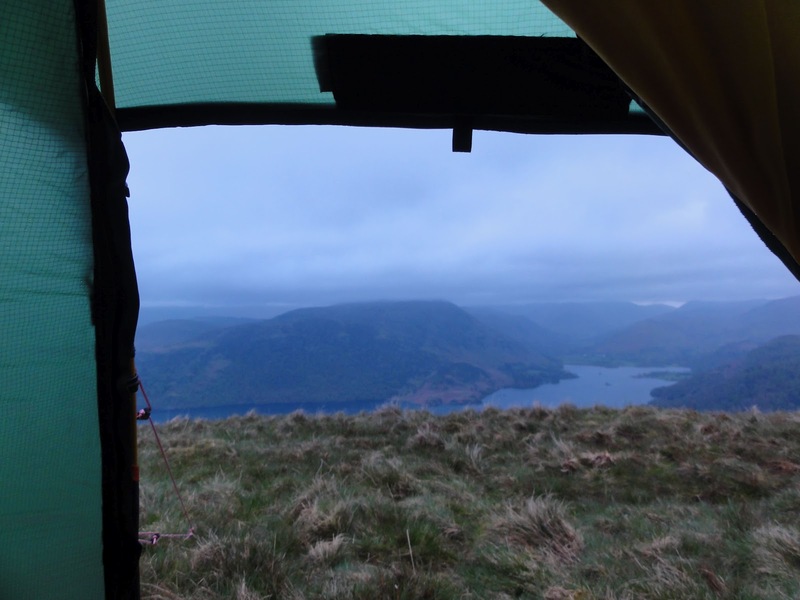 Bacon on, just the way a wild camping morning should be spent. I stood outside enjoying the weather, mind I had my down jacket on as it was still bloody cold. I lost all grasp of time and I think I packed up at about 10am. With not a care in the world a nice gentle stroll was had back to my car. So yet another fantastic trip and my week off not wasted but two really nice trips away was had. Its a bit long winded this one but written completely from my van at work in a different sort of way. Proof read and pictures added from home PMSL. If you enjoyed or if you have any ways I could make this a more enjoyable read for the readers please let me know, comment or email me at themuss@paulswildcamping.com thanks.